Hi fellas, I'm wondering if someone could help me with the mathematics involved in performing Asi Wind's, "A.A.C.A.A.N". If possible, I'd love to have a video session with you. I know...its basic subtraction, but I've still been having difficulty with doing the math in my head. Hi Rudy, I've heard a lot about Asi Wind's ACAAN. Is it published somewhere? As I recall, Asi's method is a variation of John Born's modification of Ken Krenzel's original idea. Asi does credit Ken Krenzel, as well as Allan Ackerman, Eric Mead and David Berglas. Rudy, I am several practice sessions away from attempting a public performance of AACANN. His recommendation to round up is understandable, but does it really simplify the mathematics? When it comes to subtraction, I am NOT smarter than a 4th grader. These kids are drilled on mathematics five days a week. So, I decided to make flash cards. A few rounds of subtracting random numbers from 52 will awaken your elementary school mathematical muscle memory. Lastly, time and silence are your allies. There is no need to rush. By requesting silence and asking the spectator to concentrate, you get the time and space to not only make your calculation, you gain a moment to mentally check your work. Wow, great demonstration of that principle. I've heard from others that for the most part, laymen don't find this effect that intriguing. The results were good, but not mind blowing. Would love to know (as a noob 2.5 years in), what other's experience has been. I'm reminded of Bizarro who has said several times that "Coincidence is not magic". I'm not sure i totally agree since I love Tamariz' total coincidence as well as Do as I Do, but I'm exploring that statement more and think there could be some spectators who might think this way. I'm sorry I've posted my introduction here, I saw there was a specific topic for that after I posted it here! Welcome Daniel, I like what David Blaine does with this... he takes a couple of cheeky risks after the die is cast. GreenKnight33, David's spectator in Daniel's video chooses the number 33! How did you know? Seriously, the weak link in any ACAAN effect is the blasted COUNTING! As Daniel points out, Blaine seems to arbitrarily limit the number to south of forty. I think the presentation should be strong during this requisite stage. Let's say the number is 33. Why not stop the spectator at "10" and interject with a clever question. Then, have them continue to "20" and build a little more tension with a silent pause (Blaine's spooky trademark)... ... ... "OK... please continue". Now, the spectator counts to thirty and the magician stops the action to create some doubt with the spectator's anticipation. Blaine does this by miscalling the card as an eight rather than the ace. The spectator corrects him. Blaine also says "39" when everyone knows damn well the number is 33. Now the tension is high as the final cards are slowly dealt out. I believe creating those pauses not only strengthens the drama, it helps alleviate the onset of audience ADD as the spectator drearily counts away. I agree with you Frederick, counting tricks can be very boring, because, well.. They just are.. You have to make it matter.. Build suspense, you want to make them almost to beg you to go on.. I think with an ACAAN effect the suspense is important for the other spectators but (a little) less important for the spectator telling you a card and a number. With other counting tricks, for example, a human weighing scale card effect, I think, its important for everybody, because in that case the only thing the spectator does in hand you a pile of cards and you know how many there are and count them. I love "The Heavyweight" by Pit Hartling (its a weighing scale effect), but you have to make it matter, build it up, build suspense. In an ACAAN effect, the spectator names a card and a number, so, the choices are all his and he NEEDS to know if his card is at that number. And a very important lesson as well (with every effect), learn to shut your mouth after the effect when the spectator is reacting. I still forget it sometimes but it's very important. Paul Harris wrote something on that in his first Art Of Astonishment book. Indeed, those are all good points. I think the prologue is essential to creating real mystery. Why must the magician be the clairvoyant? Why not have one spectator think of the card and another choose the position? The idea of a psychic connection between strangers, or best friends, might prove more compelling than "I shuffled the cards and put my prediction at a certain location." I think I mentioned this on another thread but - you might want to check out my effect, NUMERO UNO. Although I personally never considered it an ACAAN effect - seems that others do. i know this post is a little old but im actually doing a couple of sets for my biology, chemistry and maths classes tomorrow and wednesday and one of which is a set with aacaan. My maths skillls aren't too bad (my maths A2 exams are in the next few weeks). Hi! Thanks for mentioning this! Will look for a iOS equivalent how did it go? Barrie Richardson was a master at creating pause to both kill monotony and build drama. My Numero Uno kinda' solves that problem. Any magical effect can be boring, or at least dull, unless it is presented in a manner that moves the audience to invest in the effect at an emotional level. There are a variety of ways that can be accomplished. Harry does it with his energy. Max Maven does it with his intensity. ACAAN is a particular challenge because it requires so much exposition before one gets to the climax. My solution, which I've used for many years, involves making a spectator the "hero of the piece." The version of the plot I have performed for so many years doesn't involve the calculations employed in Asi's version, or Ackerman/Krenzel/Born/etc. In fact, my version allows the spectator to legitimately shuffle the deck before counting down to the chosen number. I included my version in my book, The Real Work, but be warned, it is not self-working. It is bold but I am not aware of any other version that maintains the level of suspense my presentation creates. That suspense, combined with humor, is what makes the effect play extremely strongly with lay audiences, and not too badly with magical audiences. The effect is titled "The Stuff of Legends," and going back more than twenty years, a friend, Elliott Walters, now past on, recorded the audio of my performance at a Connecticut nightclub. He later, with my permission, posted a transcript of that performance on the now defunct TSD chat board. That presentation works as well today as it did then. For those that try it, I am confident there will be no question about how to make ACAAN play for lay audiences. Another of your books that I'll have to buy. I'm enjoying what you sent me! I really like Brownian Movement and look forward to showing it to my wife. For those who are curious, the Brownian movement is an effect where a randomly selected card disappears from one packet and appears in another. Once I've gotten through "Pasteboard Pretensions", "Selling the Tough Stuff" and "Fooling Us", I'll get the Real Work. I'm not sure whose books you're reading but my books are titled "Pasteboard Perpension," not "pretensions," and my Lecture Notes are titled "Stop Fooling Us!" not "Fooling Us!" All that said, "Brownian Movement," a treatment of the E.G. Brown problem, leaves audiences speechless and slack-jawed. For that reason, you shouldn't use it as a closing effect--as it will result in stunned silence--but as a penultimate effect it is dynamite. If you perform it with the appropriate gravitas, I trust your wife will be impressed, but don't stop with her, perform it for everyone you know. Hi Wesley, sorry about the mistakes on the titles of your books. I was using my iPhone to type up that post and it almost never fails to result in typos. What I love about Brownian Movement is how relatively easy it is to perform (in terms of method). It gives you an opportunity to focus on presentation and connecting with your audience. There are actually two versions of Brownian Movement: A close up version, for small groups, and a Stand-up version for larger groups, in parlor type situations. The patter for the two versions are essentially identical but they use very different sleights to accomplish the requisite end. If your performance venues allow, try both; both play exceedingly well in their respective venues. To your point, both are technically relatively easy but both require considerable presentational address for optimal audience response. Give the presentation the necessary clarity and build up and you will be justly rewarded. I like Brownian Movement (The Sequel) as described in Enchantments - one of my all time favourite books. It is a powerhouse effect, contingent on strong presentation. I have developed a slight handling variation, out of necessity to deal with stubborn spectators, which is easy and deceptive. There are many other wonderful effects and techniques in Enchantments. If by "stubborn spectators" you mean spectators that don't follow your instructions, in the vast majority of cases the failure is yours. If you engage the spectator who will assist you in conversation prior to beginning the effect, you should be able to determine whether the person is capable of understanding your instructions. If they don't seem capable, use a different spectator or do a different effect. If they are capable of understanding your instructions, you must make the wording of your instructions so clear that they cannot fail to understand. I have been performing the effect for many years and I can count on one hand the number of spectators that have failed to follow my instructions. The bigger risk is that they will forget the card of which only they know they are thinking. The best solution to that problem is to pre-screen your spectator by asking for the assistance of someone with a good memory. You will almost always find someone who prides him/herself on their memory. It is also wise to preface the effect by acknowledging that the effect doesn't always work and by explaining that since only the assisting spectator will know their thought, the audience is counting on them to remember their card. If you include remarks to the effect mentioned, you should very, very rarely have any difficulty with what you call "stubborn spectators." What I mean is that there have been cases when the verbal emphasis to instruct the spectator’s choice did not yield the expected result. I perfectly accept that the fault is all mine. It was however simple enough to change the handling so that it did not matter. A technical solution was easier to implement because of my short-comings. I have been performing Brownian Movement since your book came out in 2004 and it will stay in my repertoire. I hasten to add that the effect as described in Enchantments is perfectly fine, easy technically, and its impact tremendous when well presented. Numero by Area51 instant download, not expensive. the add is a bit misleading but if you go with the first method taught it is a borrowed freely shuffled deck. Free choice of card and location. There are some sleights that if you don't know you have to learn, but honestly they are not that difficult and the best part is? No math. Hi Bmat, I did a Google search for Numero, but couldn’t find it. Can you give me a link? Penquin magic. I just want to be clear before you spend, the demo they give on the video is not the method that you can use a borrowed deck. The demo they show does use a gimmick deck. However they get away with saying that its impromptu borrowed deck blah blah because one version they teach is. And it is really good. (my opinion) and well worth the $6.00 they are charging for the download. Be warned however the trick is bold and does use a few sleights that you may not be comfortable with. I don't think I would call it a beginner trick. I tend to use a lot of misdirection, and it took me a little courage to do it the first few times. But it works and its wonderful. spectator shuffles. Spectator names any card, spectators chooses any number between one and fifty two. No math on your part. No advanced set up. Borrow the deck. 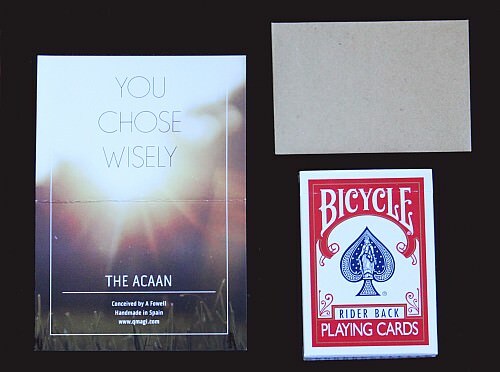 Adrian Fowell's new release You Chose Wisely is a new addition to the genre that people interested in an ACAAN routine might want to look at. He builds on the work done by Asi Wind and John Born, but eliminates the need for memorization, and also alters the mechanics of the required move, by introducing a concept that (to my knowledge) has never been applied to an ACAAN before. It's not for everyone, but the overall effect is the same, but the procedure is simplified, making it more accessible for many who might not have the skills needed to perform the Asi Wind version.